At first glance, Servo looks like fairly standard sci-fi RTS fare, with giant fighting robots called servos doing battle on the surface of Old Earth over the dangerous but highly lucrative resource called Bloom. But underpinning the action is a persistent scavenging element with RPG-style progression, as parts and weapons discovered during missions can be added to your servos to make them more powerful for future missions. Servo will offer a single-player campaign with 25 missions as well as co-operative and PvP modes, but unlike most RTS games, individual missions will be fairly short, typically running just ten to 15 minutes in length. "That feels actually pretty great," Dave Pottinger, co-founder and president of developer BonusXP, says in the announcement trailer. "You play a ten or 15-minute game, you get a new part, you decide if you want to keep it, if you want to keep it you go put it on one of your servos, and you have at it again." "Designing a team of Servos that works well together to execute your strategies – and can react to the new challenges each match brings – is as important as building up an economy or landing a perfect rocket swarm," the team said in the announcement. 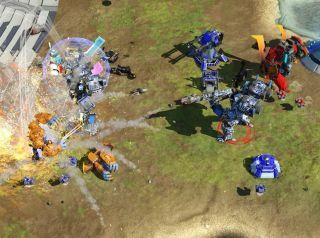 Servo is being developed by BonusXP, an indie studio formed by veterans of Ensemble Games including Pottinger and Bruce Shelley, who co-designed the original Civilization along with Sid Meier before joining Ensemble to help create Age of Empires. It's scheduled to launch via Early Access "in the coming months" ahead of a full release later this year, but preorders can be placed now at servogame.com.